There are 2 recipients of the Air Force Cross which was awarded for exemplary and heroic service during World War II. Both of the men awarded were belated presentations. 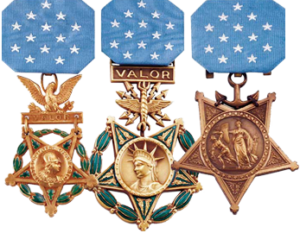 Major Drew was nominated for the Distinguished Service Cross (DSC) during World War II, and it was denied. Decades later when new information was uncovered, his nomination for the DSC was revived and, since the Air Force now had its own award equal to the DSC, he received the Air Force Cross. Similar circumstances led to the award for William Sloan on or near the year 2000. The President of the United States takes pleasure in presenting the Air Force Cross to Urban L. Drew, Major (Air Corps) [then First Lieutenant], U.S. Army Air Forces, for extraordinary heroism in military operations against an armed enemy of the United States as Pilot of a P-51 Fighter Airplane and Leader of Blue Flight, 375th Fighter Squadron, 361st Fighter Group, 8th Air Force in action near Hamm, Germany, on 7 October 1944. On that date, Lieutenant Drew became the first Allied pilot to shoot down in combat two ME-262 aircraft. Through his extraordinary heroism, superb airmanship, and aggressiveness in the face of the enemy, and in the dedication of his service to his country, Lieutenant Drew reflected the highest credit on himself and the United States Air Force. The President of the United States takes pleasure in presenting the Air Force Cross to William J. Sloan, Lieutenant Colonel (Air Corps), U.S. Army Air Forces, for extraordinary heroism in military operations against an armed enemy of the United States as Pilot of a P-38 aircraft in the 96th Fighter Squadron, 82d Fighter Group, 12th Air Force, in the North African Theater of Operations on 5 July 1943. On that date, Colonel Sloan led a flight of fighter aircraft escorting thirty-six B-25 bombers in an attack on Gerbini Airdrome. The formation encountered intense antiaircraft fire in the target area and was attacked by ten enemy fighters. Colonel Sloan shot down two of the enemy fighters and was conspicuous in driving the remaining hostile fighters away from the bombers, all of which returned safely. Through his extraordinary heroism, superb airmanship, and aggressiveness in the face of the enemy, Colonel Sloan reflected the highest credit upon himself and the United States Air Force.